A prolific Italian band whose every release was something different. In release are their horrible 60's beat debut Senza Orario Senza Bandeira as well as the packaged Concerto Grosso Per 1 and 2, complete with orchestration and also resembling 60's music although more in the style of Hendrix or the Moody Blues. Every once in a while -- maybe once a year -- I'll discover an album so fantastic that I can't stop playing it. In the 1970's, it was material by ELP and Yes. The early 1980's introduced me to The (Dixie) Dregs... an instant love affair. I learned about Gentle Giant and Allan Holdsworth in the mid-80's, and most recently I've found PFM, Art Tatum, and Caravan. 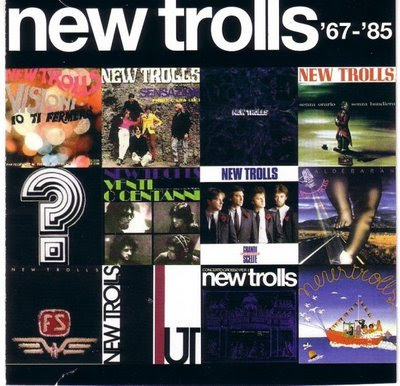 My "album discovery of the year' for 1992 is UT by the New Trolls. It is spectacular! Recorded and released in 1972, it is available on CD in both Italian (Fonit Cetra CDLP 430) and Japanese (number unknown) pressings. The following is a detailed review of the album. First, an overall impression: WOW. This is an impressive piece of work. The performance is excellent, and the music is quite varied in style. If you like ELP, Gentle Giant, Peter Gabriel's Genesis, PFM, and Yes, you will probably love this album. And interestingly enough, it has turned several die-hard heavy metalheads into New Trolls fans. It's rare to find a band with such versatility. They play intricate counterpoint and beautiful melodies with ease... and yet they can rock as hard as any heavy metal band. Their style is a blending of many others, but it sounds original. I have heard that the various New Trolls albums sound wildly different, and some are pretty poor. So, if you have previously heard NT and disliked them, I recommend giving UT a listen anyway. BTW, if you like UT, I also recommend that you check out their Concerto Grosso No. 2. Overall, it's not quite as good as UT, but it has some real standout moments. I just bought it, and I've been humming it for a week. They started as a rock band (like Hendrix, Vanilla Fudge). The best album is Concerto Grosso Part 1 with a mix of classical and rock music. From the album Aldebaran the sound became more commercial (like Bee Gees). The New Trolls are a band whom I understand have gone through a couple thousand different permutations and musical stylings. (Hallmark of a classic progressive band....change lineups and music with the weather....ala King Crimson, Yes, Gong) Their classic is generally regarded to be UT I would have to agree. While I do not possess any other of their disks, this one is definately classic. Very much in the symphonic vein, I find this to be a disk that grows on me with each listen. I hear something new everytime. The vocals are in Italian. However, they are appropriate and while some foreign vocalists can grate that never happens here. Those that enjoy some of the less mainstream Tull will definately enjoy this. All in all, a must. New Trolls were an Italian band whose output has been quite inconsistent, in that they have released hard rock, pop ballads, and progressive rock works. As far as their prog rock releases are concerned, their highlights were UT, and the two separate albums, Concerto Grosso Part 1, and C G Part 2. The Italian CD reissue combines both of the latter into one CD, which, in addition to the high quality of the music, also offers good value for money. On to the music... The compositions are all motivated by classical music motifs, and are entitled "Allegro," "Vivace," and so on. However, the presentation is in a rock format, and the group has achieved this very well. This is prime classical rock, accompanied by an orchestra conducted by Luis Bacalov. The only comparison I could possibly make would be to Ekseption, but this music is far beyond the lightweight classical-based songs of that band. In short, if the idea of classical music within a rock context appeals to you, this release will definitely not disappoint. I recently picked up their highly regarded 1972 release called UT. This album is an amazing amalgam of progressive rock covering a wide variety of styles yet it remains cohesive rather than schizophrenic. There are references to several of the "big names," including Yes, ELP, Genesis, King Crimson, Focus, and the general 1970s Italian progressive scene, including PFM but the music is uniquely their own. Musical energy is abundant as is complexity and variety. Though there is plenty of excellent, melodic keyboard work there does seem to be a slight emhapsis on the driving, high-energy guitar. The Italian vocals aren't harsh in any way and shouldn't be a detraction. This album is highly regarded for a reason. Get it!